Mahatma Ghandi (1869-1948) - Indian pacifist who succeeded in gaining independence from Great Britain through non-violent measures. He was born in the city of Porbandar on the Kathiawar Peninsula up in the Northwest corner of India; but rose to prominence while living in South Africa. In 1893, at the age of 24, he traveled there to become a lawyer for wealthy Indian Muslims (though he himself was Hindu) living in that country. Ghandi stayed in South Africa for 21 years. It was there that he experienced discrimination and segregation first-hand. And it was there that he began to formulate his political and social ideas. These ideas involved more than just white racism. The Indian Muslims kept Hindu servants who were also Indian, which Ghandi saw as an injustice. In 1915, he returned to India and was determined to apply what he learned in South Africa to free India from British rule. Ghandi made it a point to work within the existing system to achieve his ends rather than become a revolutionary. He joined the Indian National Congress, rising to a leadership position in 1920, and began unifying the population in favor in independence. Congress declared it in 1930, but Britain refused to recognize it. However, Ghandi's methods at least opened discussions with the British government. Things turned sour, however, with the outbreak of World War II, when England compelled India to participate in the war without consulting the National Congress. Ghandi retaliated by convincing the Congress to demand immediate independence, which Britain once again denied. Furthermore, British authorities threw Ghandi and several other members of Congress in prison for their defiance. After the war, though, Britain relented and granted independence. It was not a unified India, however, as Northern Muslims wanted a nation of their own. In 1947, the state was partitioned into Muslim Pakistan and Hindu India. But Ghandi was assassinated on January 30, 1948, by a Hindu nationalist, named Nathuram Godse, who disagreed with his peaceful policies. Nonetheless, he gained a legacy which endured his death. As a result, his methods were adopted by others, such as Martin Luther King Jr., to effect social change. 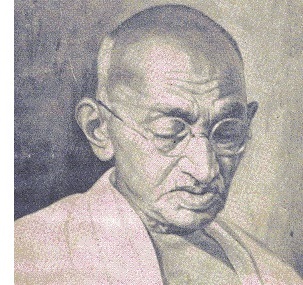 His birth name was Mohandas, but he was bestowed with the title of "Mahatma" in 1914, which is Sanskrit for "great soul".